Ever since summer rolled around, I’ve been crazy for ice cream. Armed with my candy-apple red Cuisinart ice cream maker (so much better than a red sports car) nothing can stop me! I’ve been trying everything in that machine: egg nog ice cream, goat milk ice cream, rosemary infused ice cream with strawberries, ice milk with balsamic & vanilla bean and plum sorbet (with plums straight off my tree). After having sheep cheese ice cream in Basque country this spring, I’m not satisfied with merely cow’s milk ice cream: I need more gamey flavor! It’s surprisingly good in ice cream, because adding sugar and other ingredients, heating it on the stove, then freezing it makes it much milder than you think. Goat milk ice cream has become my favorite, shown above, with its creamy texture and mild flavor, using this recipe I found online. I use this recipe as a base, add local honey and herbs from my garden – like rosemary or basil – to the milk while it heats, then take it off the stove and add a lid to let it steep before cooling. I love this unique flavor addition! And I love to top it with summer berries or add strawberries to the ice cream mixer, as shown above. Or I top it with plum compote. The next day, I can’t resist pouring the compote into the ice cream machine to try it as a frozen sorbet treat. Nothing is safe, I tell you. Heat sauce pan on stove over medium heat. Whisk the egg, then add it, honey, salt, half-and-half, milk and rosemary to the pan. Heat slowly, stirring with wooden spoon, just to a simmer (not boiling), then take off heat and cover with a lid for 10 minutes. Discard rosemary. Cool milk mixture in fridge or freezer until cold. Pour into ice cream machine and freeze according to machine’s directions. 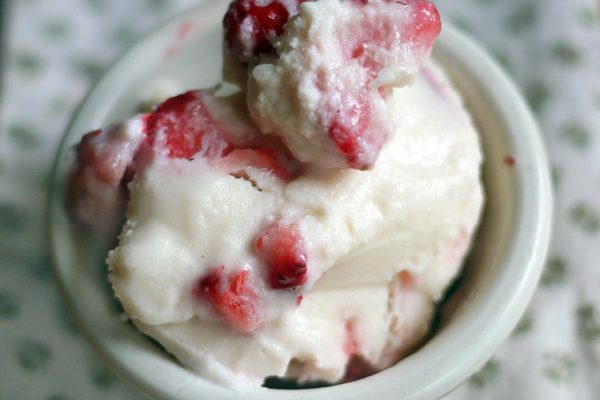 Add strawberries while ice cream is freezing in machine, or use as a topping.